PLA is a renewable plastic material offered as a low-cost material option for fast-draft part iterations. Available on the office-friendly Stratasys F123 Series 3D printers, PLA offers a higher stiffness than ABS and its low melting point and HDT mean less heat and power required to print parts. PLA works well at high speeds, specifically fast- draft mode on the Stratasys F123 Series, for quick concept verification and design development. PLA offers good tensile strength and is available in 11 colors: natural, transparent red, transparent yellow, transparent green, transparent blue, black, white, red, blue, light gray, and medium gray. 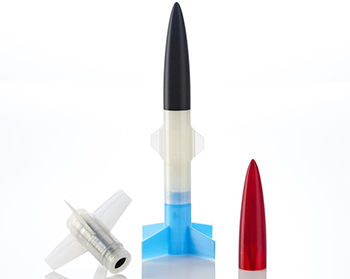 Ideal applications for PLA include early concept modeling and fast prototyping.